Home / Film / Battle of the Sexes: does she have the nerve? Battle of the Sexes: does she have the nerve? Fair disclosure: I am not a tennis aficionado. 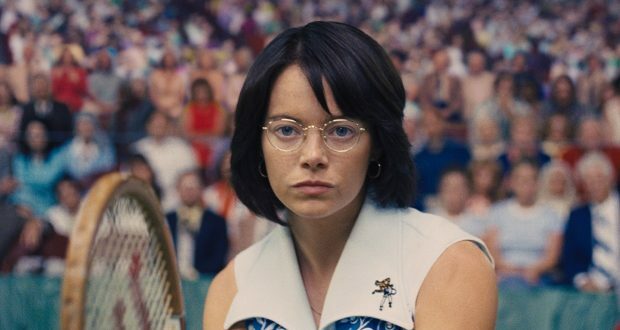 Although I did know about the high stakes exhibition game between Women’s Champion Billie Jean King (Emma Stone) and former ace Bobby Riggs (Steve Carell), the details and wider context of the story were lost on me. As a result, I can make no claims to the accuracy of Battle of the Sexes, but when have I ever couched much value in that? 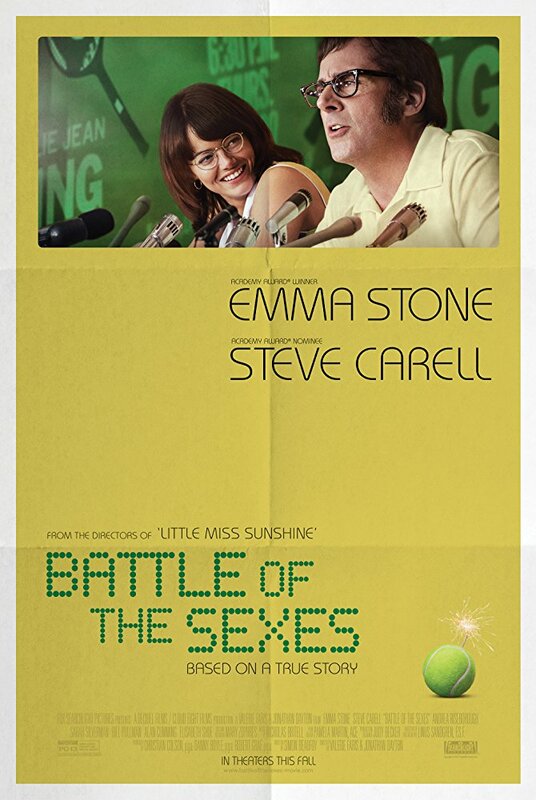 An example of a templated sports film done well, Battle of the Sexes proves itself capable of engaging the audience in its sporting drama and picking apart the web of 1970s sexual politics. Having split from the United States Lawn Tennis Association (USLTA) over grotesque disparities in prize money between men and women, Billie Jean King and eight other players formed their own touring circuit. Bored and unfulfilled since the sun set on his own career, former tennis no. 1 Bobby Riggs sprung on the vitriolic politics stirred up by these actions to establish a challenge match. With a showy campaign of gleeful sexism, Riggs sought to prove that men are just better. Bobby Riggs is actually an interesting antagonist in this heavily politicised context. We establish early that his chauvinistic campaign is a front: that he does not believe most of the nonsense he is spouting and Billi Jean dismisses it as such. This behaviour stems from some pathological behavioural trends (not least of which is a gambling addiction) and the obvious dissatisfaction with his post-tennis life. Although the showdown with him is the symbolic crowning moment, Riggs is himself not the thematic villain but rather an insincere frontman for an oppressive social apparatus. Though the fact that this existing apparatus and is so ready to champion him is well beyond sinister. Steve Carell does an entertaining and remarkably sympathetic turn as Riggs, proving how a certain degree of hustle and charisma carried the rhetoric of sexism. That is one of the strengths of Battle of the Sexes overall: it does a good job of showing how complex the systematised misogyny of the time was. King and her allies must contend with the flagrant misrepresentation of their position, the intractable but nonsensical mentality of bigots, the shady and unquestioned dealings of the tennis establishment in their men’s clubs, and the financial entrenchment of inequality. The thematic villain of the piece is, far more than Riggs, framed as Jack Kramer – the former player, commentator and tournament chairman within the USLTA played by Bill Pullman. Battle of the Sexes does not stoop to depicting sexism as a global conspiracy with a crooked figure at its head, but Kramer gives voice to a lot of the sexism that Riggs is merely projecting for personal advantage. Furthermore, he is in a much more inscrutable position to enforce his ideology. Much like Carell, Pullman isn’t playing a cartoonish villain but an affable man who has never questioned his behaviour and has free reign to act on it. The other major narrative strand is a queer one. We follow Billie Jean King’s initially closeted identity as a lesbian when she falls for Andrea Riseborough’s Marilyn. This element is, I suspect, the most heavily embellished to fit with standard film formulas on romance but that’s not to say it isn’t an effective or touching strand to the film. It perhaps gets a bit muddled on the point of whether King’s first priority is the tennis over her relationship status or whether accepting her newfound sexuality allows her secure the mentality that will allow her to face down Riggs. In either case, Stone is a compelling lead throughout and her Riseborough brings a lot of weight to a role which could have been a dangling appendage on the plot (when will she be given more prominent roles on screen!?). Whilst the Battle of the Sexes is not narratively or structurally revolutionary, it is very well executed. Unlike a certain other film this year which tried to position itself as a feminist poster child, this film is up to the task of tackling women’s right and interlacing that with a message about LGBTQ equality too. It doesn’t use its overt political grandstanding as an excuse for shoddy craftsmanship, and it makes sure that the story works as much as its ideology. A thoroughly impressive fair on all fronts. Verdict: It takes some distinction for me to like a sports film, and Battle of the Sexes is up to the task.